The 3rd Annual Texas Fatherhood Summit was held on June 29, 2018 at the AT&T Executive Education and Conference Center in Austin, Texas. The Summit's theme was Engaging Communities, Strengthening Families, putting a lens on why and how the inclusion of policies and programs that support fathers at the community level strengthens the entire family, as well as the communities in which they live. 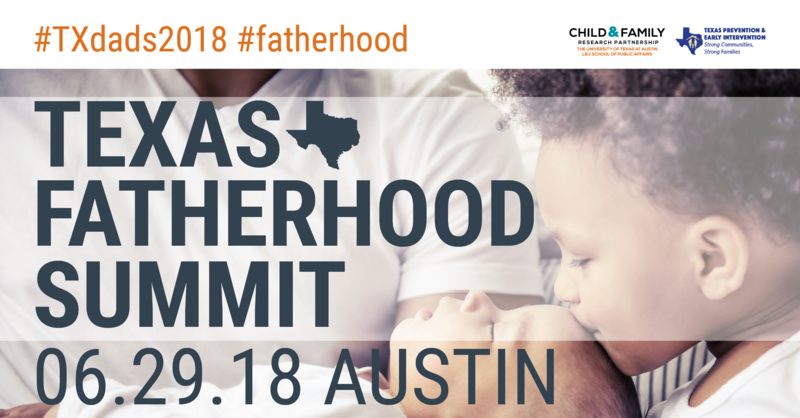 The annual Texas Fatherhood Summit at The University of Texas at Austin brings together hundreds of public and private sector professionals who seek research-based best practices and innovations to best support dad, mom, and their children. The 2018 Summit was especially relevant for policymakers at all levels of government, community leaders, nonprofit organizations, program leaders, and local business professionals. Paul Schmitz builds the collective leadership of organizations and communities to achieve greater social impact through his roles as Senior Advisor at The Collective Impact Forum and CEO of Leading Inside Out. He is also the author of Everyone Leads: Building Leadership from the Community Up, and the former CEO of Public Allies, where he helped more than 5,000 diverse young adults begin careers working for community and social change. Mr. Schmitz is a faculty member of The Asset-Based Community Development Institute, was a social innovation advisor to the Obama White House, and has been named three separate years to The Nonprofit Times list of the 50 most influential nonprofit leaders in America. He lives in Milwaukee, Wisconsin with his wife and five children. More: Leading Inside Out. The Texas Fatherhood Summit is hosted by the Child and Family Research Partnership at The University of Texas at Austin LBJ School of Public Affairs and the Texas Department of Family and Protective Services Prevention and Early Intervention Division.